If you spend any time around children, then you know that not every child learns the same way. However, one great learning tool you can use every day is blocks. Using blocks for preschool learning is one of the best ways to teach and have fun at the same time. 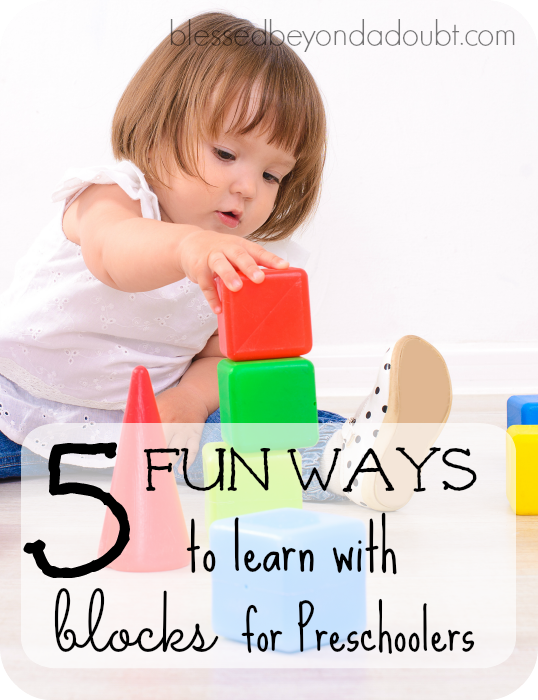 Here are five ways to use blocks for teaching a preschooler basic fundamentals. Using blocks to teach counting is a smart idea. It’s easy to use blocks to teach a preschooler to count because they can touch and see what they are counting. Your preschooler can build and count at the same time making the activity extra fun. Colors are one of the first things that a preschooler learns when it comes to basic concepts. One way to teach your preschooler about colors using blocks is to have them play a matching game. Ask them to find the colors that are the same and stack them off to the side. “Find all of the red blocks for me.” “Okay, now can you find all of the blue blocks for me?” “Show me something in the house that matches that block.” Using simple statements, you can prompt your preschooler to dig deeper into their color learning block lesson. One of the best preschool concepts to teach preschoolers using blocks is shapes! A great activity to do with your preschooler is to take a pencil, paper, and colored pencil. Have your preschooler trace the shape of the block. This is a powerful activity because the preschooler is using learning so much just using something as simple as a block. Don’t forget to ask them what type of shape they just traced. A preschooler is never too young to learn about the power of adding and subtracting. Taking basic blocks and talking about addition and subtraction can help your preschooler learn about these concepts earlier. Line up four blocks and ask your child to remove two blocks, this is a basic subtraction lesson you can do with them using blocks. When they have mastered that skill, ask them to add two blocks to the lineup. Get a little creative and ask them to add two blue blocks to the lineup. See how creative you can get there? Do you know how important it is for children to learn about block building ? Hand and eye coordination is a big one. Block play is also important for preschoolers because it’s a simple but they are using their imagination to build and create something. As a child grows older, building blocks helps them practice balance and teaches them about organization. What are some ways you use blocks to teach your preschooler? Blocks are great objects for helping children learn. We love them for building, letter recognition, and word building. I would love for you to stop by Tots and Me…Growing Up Together. My weekly linky, Littles Learning Link Up is live right now, and next week’s will go live on Tuesday.